While we are still on the topic of getting yo’ kids to listen, I think we can ALL relate to the following conversation had by a momma and her 4 yo daughter. Home girl, you don’t even know what tired is until you haven’t slept for 4 years but that is content for an entirely different subject matter, lol! On a more serious note, it is extremely helpful to remember when giving directions that you give only one or two step instructions and that it is clear and specific. It is easy to give these long, drawn out directions in the hope that they follow through (i.e. “Stella, I would really like it if you would please put your toys away. It would really make mommy happy!”). Although that is a nice statement, it is way too long and full of verbiage. Instead, try making it as simple as, “Stella, please pick up your toys!” Easy to understand, clear and to the point! Lastly, make it FUN! 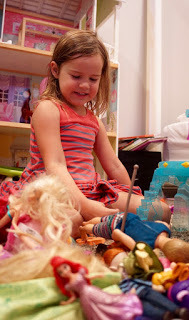 Turn it into a game and make clean up a part of the play time. Maybe it’s a fun clean up song or even a race to can clean up the toys the fastest… Whatever gets those foot piercing land mines of Legos or Barbie shoes up the fastest, who cares how it gets done.